Wow. 2010 already. Anyone else feeling a bit shell shocked? I have been in Phuket just over 10 years now, arrived in November 1999. No plans to stay, just looking for work as a dive instructor. Fast forward 10 years, happily married, 2 children, lots of bills to pay (house, car, school).. is this not just like any normal life anywhere else? Not quite. I am very happy living in Phuket, although at times in the high season (that's now!) there is not much time for relaxation - running even a small dive shop needs fairly long work hours, 6 days a week. 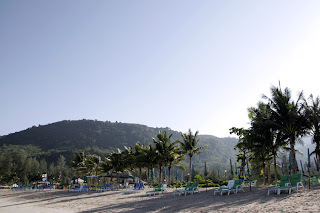 Family has to come first, so the poor Phuket blog does get neglected at times in the high season. I still try to update this blog about once per week, and the weather blog maybe a bit more often. 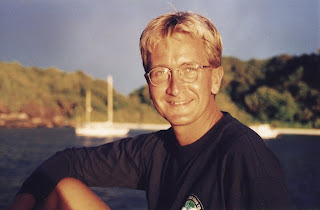 January - as I said, it was just over 10 years ago that I got to Phuket, the main aim was to find work on a liveaboard dive boat - so I wrote something about that : Liveaboard Diving from Phuket. Photo below... me 9 years ago in the Similan Islands. Next, a review of the luxury Sala Phuket resort, one of the best hotels you can find here. I try not to add too many hotel reviews on the blog, but occasionally, when we've not had time to really get out and do anything much, I'll add in a hotel... always looking for new or interesting hotels to review. 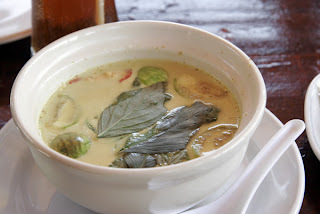 Same with restaurants - although we are getting a bit middle aged and tend to eat again and again at the same places, I try to get to new restaurants and sometimes we find good ones like the Uptown restaurant in Phuket Town, a big local favourite with a huge menu of different noodle dishes. Also in January, I had a quick visit to the new Phuket 91.5FM radio station which over the year has established itself as probably the No.1 station for Phuket. February - another new Phuket Town restaurant - Rimtang specialises in local dishes, and another hotel review - Boomerang Cottages in Kata, not on the beach, up on the hillside, and always gets good reviews it seems. 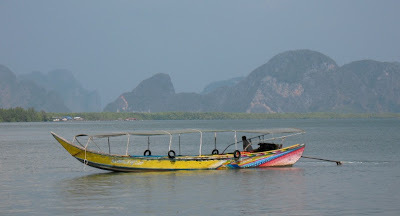 Later in February we headed out of Phuket into Phang Nga province just over the bridge and found a great restaurant called Sam Chong Seafood. 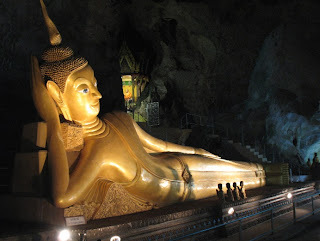 Not far from there, the temple of Wat Suwan Kuha which is built into a cave. March - a quick visit to a temple in Phuket Town - Wat Vichit Sangkaram - eventually I will try to blog all the temples in Phuket! 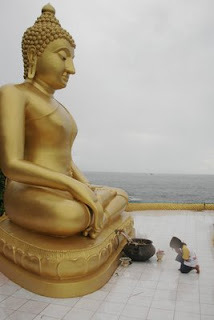 I did a review of the new TravelFish Guide to Phuket, a review of the Agoda hotel booking website. 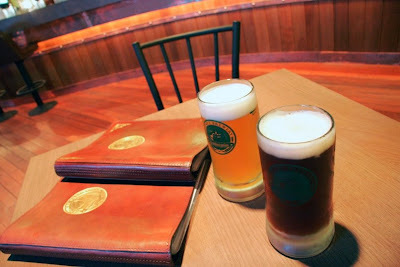 Found time to try the new Phuket Brewery just outside Phuket Town which has a microbrewery and live music with big name Thai stars performing almost every weekend. 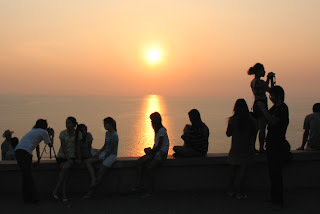 We also went to Cape Phromthep - not for the first time but amazingly the first time I had been there for the sunset. April, come she will. Kamala Beach - I think kind of the forgotten beach of Phuket, still very quiet, it's just North of Patong, but about 500 times less crazy! Phuket Town - for me, the best bit of Phuket, lots of hidden surprises, and a few were uncovered in April. First, yet another very popular restaurant with locals called Kaewjai, just a block from the bus terminal, been there for nearly 50 years and my wife and I have been back several times during the year. 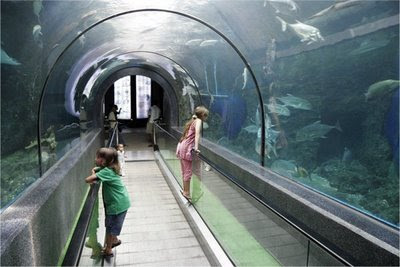 Then there was the Crocodile Farm... not for animal lovers and I read things about them keeping some animals illegally. 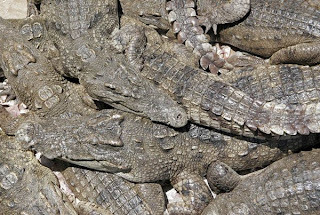 Lots of crocodiles. And some tigers, and a few other animals. Later in April I finally found the not-easy-to-find Shrine of the Serene Light, in the old part of town. 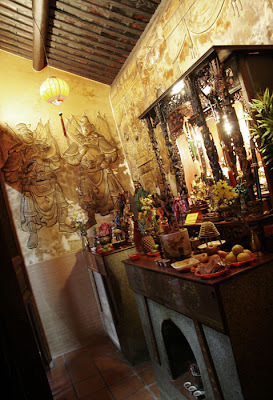 Very beautiful old Chinese shrine. But April of course is best known for Songkran - the traditional Thai New Year. 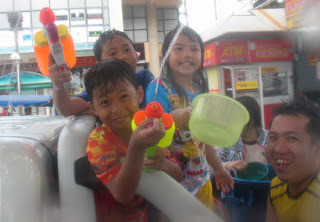 This year on April 13th we loaded up our pick up truck with barrels of water, drove around Patong and the whole family had a fun time - photos here: Songkran 2009 in Patong. 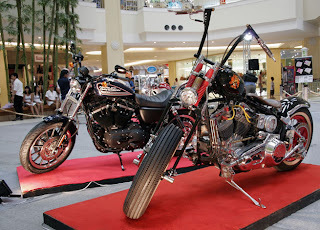 And you also have Phuket Bike Week just before Songkran, I went to see some bikes this year down at Patong Beach and in the JungCeylon mall. May - I enjoyed looking around the Phuket Halal Expo, held at Sapan Hin, a large recreation area in the south of Phuket Town. 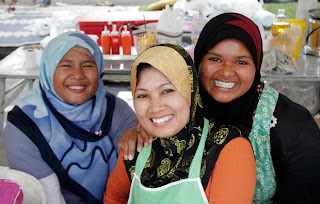 Lots of food and smiling faces - the event was to promote Phuket's large Muslim community. 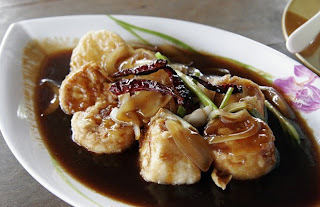 I like to find simple and not (too) expensive restaurants on the beach - found one at Nai Yang Beach called Batik Seafood. Nai Yang is pretty quiet and there are many small restaurants. A few days later and we ate at another new restaurant called Lakeside, way off the beaten track and run by a former neighbour of ours. June - halfway through 2009 - and I think I better add a "Part 1" on the title and carry on with Part 2 in a couple of days... way too much to talk about on one blog post! We took a very interesting trip by longtail boat from Rawai Beach to Koh Kaew Yai, a small island just off the end of Cape Phromthep. 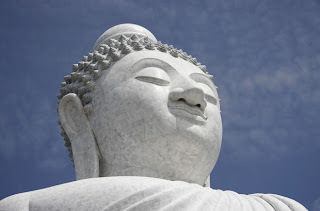 Stories say that the Buddha visited here before landing in Phuket at Rawai. 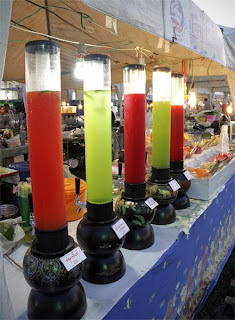 And not long after we were at Sapan Hin again for the One Tambon One Product Fair - lots of food, drinks and crafts. There are regular events at Sapan Hin, always worth a visit. Jamie's Phuket 2009.. Part 2 here.